In the 1960s, French artist Alain Jacquet made a series of works based on famous paintings from art history. They highlighted the way some works of ‘high art’ had infiltrated popular culture through their wide circulation in mass reproduction. This work imitates 19th-century realist painter Edouard Manet’s Déjeuner sur l’herbe 1865. 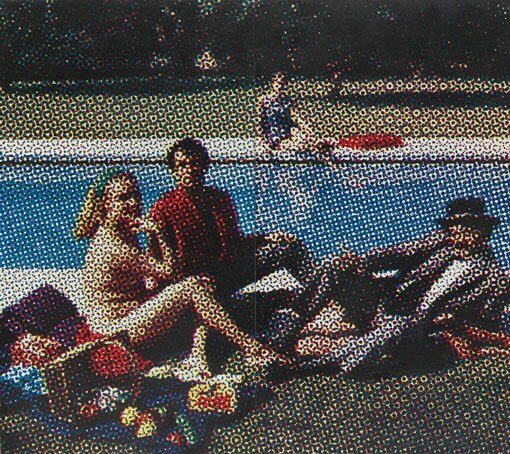 Jacquet restaged Manet’s composition with his own friends posing in a modern setting, by a swimming pool. Rather than capturing the scene in paint, he photographed it, then used a screenprinting process to replicate the image. The enlarged Benday dots allude to the offset printing colours of cyan, yellow, magenta and black. The resulting optical effect reveals the work’s mechanical production, and exaggerates the print technique and graphic visual style of mass media. This work also appears in the children’s labels. Compare Manet’s Déjeuner sur l’herbe with Jacquet’s Déjeuner sur l’herbe (diptych) . Why do you think Jacquet chose Manet’s work to appropriate? What has he added and/or taken away? Discuss how Jacquet also references his own world in this image, including mass-media printing techniques used at the time. Think about how the European pop artists responded to their world. Why do you think they reworked ‘old masters’ and critiqued consumerism and Americanisation? Find examples by pop artists across Europe and discuss the distinct regional differences in their approach to artmaking. Pop art emerged in many places across Europe in the early 1960s, including Germany, France, Italy and Scandinavia. There were often distinct regional differences as artists responded to their particular creative, social and political circumstances. Some reacted to the exoticism of American pop art, while often remaining wary of the global ‘coca-colonisation’ of an increasingly dominant American culture. In France, the nouveaux réalistes or ‘new realists’ group – including Martial Raysse and Niki de Saint Phalle – incorporated objects and imagery related to consumer society in their art. In Germany, the Capitalist Realist art of Konrad Lueg, Sigmar Polke and Gerhard Richter reflected their ambivalence to West Germany’s embrace of capitalism, and parodied its friction with the socialist regime in East Germany. During the decade, numerous European artists working with a pop aesthetic also made the pilgrimage to New York – by now pop art’s undisputed epicentre. In keeping with their diverse approach to style and technique, the European pop artists pursued a range of ideas. Some considered the effects of mass reproduction (such as Gerhard Richter); others reworked ‘old masters’ from art history (such as Alain Jacquet); or offered a critique of consumerism and Americanisation (like Öyvind Fahlström).